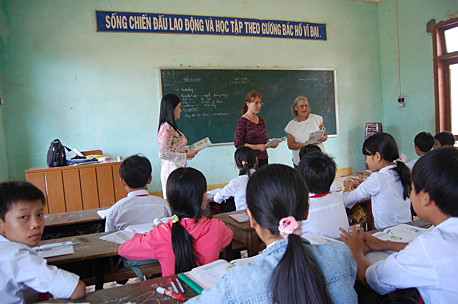 In 2009, Marge Nelson began volunteering with another Friend assisting in the Tinh Khe Primary School and assisting the six English teachers in theTinh Khe Middle school. For three consecutive years, they worked for two to three weeks at the teachers' direction with students in the classrooms, and also held sessions with teachers to help them with pronunciation and to answer questions they had. In 2011 Rick Burnson visited and observed the Tinh Khe Primary School and talked with the teachers at the Tinh Khe Middle School. In addition to this, Phan Van Do was able to arrange a meeting with the Department of Foreign Affairs (DoFA) to discuss possible cooperation between MQI and the province of Quang Ngai. Seven participants from many different entities in Quang Ngai made it very clear that there was a strong need for native English speaking teachers. Further discussions with Phan Van Do during his recent visit to the U.S. helped to clarify a plan to engage teachers for the Quang Ngai province who would teach at a variety of schools with further planning being needed to expand on the idea of English language teaching in Quang Ngai City. Keep checking as this plan develops. In March, 2008, I joined a Madison Quakers Inc. delegation to attend the 40th anniversary memorial service at the site of the My Lai massacre in Quang Ngai, the province where I had worked with AFSC during the war. I had supported MQI work for several years and wished to see their projects. After the memorial service, we went to the My Lai Peace Park nearby which MQI had built; then went to Tinh Khe Primary School #1 for the groundbreaking ceremony of the Administration Building. MQI had already built the two classroom buildings now in use by over 200 children and their teachers. There I met Luu, the English teacher, and she showed me her classroom. That evening I discussed with Phan van Do, MQI Vietnam Project Coordinator, the possibility of returning the following winter to volunteer as a teacher aide with Teacher Luu. He encouraged me but the school principal was uncertain. “If you come to teach English, then what would the English teacher do?” he asked. “A teacher-aide works under the direction and supervision of the teacher. I would do whatever she asked me to do.” I replied. However, from the first year, we realized that it would be helpful to develop a working relationship with a university department training teachers for English as a Second/Foreign Language (ESL/EFL). In March, 2011, a representative from the U. of Wisconsin Madison was able to come and observe our work. He was supportive and enthusiastic about pursuing a continuation and possibly expansion of an MQI program of EFL in Quang Ngai. There is widespread demand in Quang Ngai province for Vietnamese who are fluent in spoken as well as written English.